We are devoted to the preservation of the Japanese Shiba Inu. The Shiba Inu is an amazing breed; unique to all others. This breed calculates its next move. It analyzes and responds in thoughtful ways. We want to share the qualities of this breed and honor the hard work the Japanese did to recover the Shiba Inu from near extinction. The Shiba Inu has fewer health problems than almost all other breeds. Isn’t it fascinating that a breed which was once nearly extinct, is now one of the healthiest in existence? Not only did the Japanese save this breed, but they saved a part of history. Its DNA makeup suggests the Shiba Inu is one of the oldest living breeds and one of the closest related to the wolf. I don’t know about you, but I have such strong regard for the Japanese who cared and worked and fought for this breed to accomplish not only its continued existence, but to save a part of history and with such strong results in temperament, intelligence, and health. We are one of the few breeders in the world who have Shiba Inus imported directly from Japan. All of our dogs are imported or direct offspring of our imports. Each one has exceptional bloodlines. Their parents, grandparents, and great grandparents have won in Japan at the national level where there are thousands of Shiba Inus to compete against. These are the best of the best. As offspring of superior bloodlines, our dogs have won many accolades in the show rings here in the US. 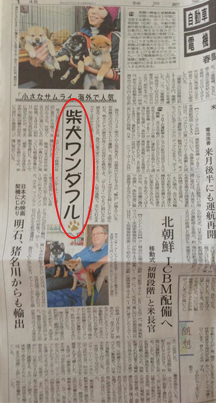 We have been honored by the Japanese Dog Preservation Society (Nippo) with inclusion into their organization. Not only are we members of the Japanese Dog Preservation Society (Nippo), but we are an officially approved kennel! There are only a handful here in the US. 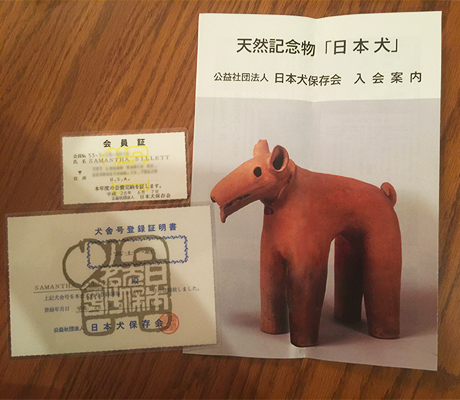 Here is our official Nippo membership card, Nippo approved kennel card, and Nippo literature. We are very proud to be accepted into this organization and are committed to this breed. 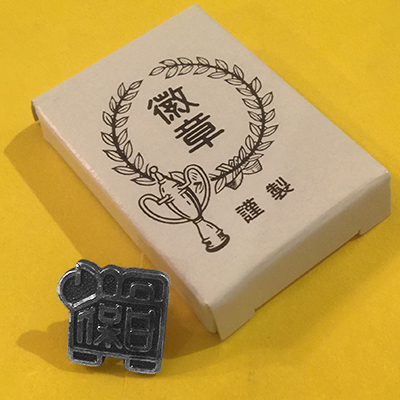 This is the Official Members Only Lapel pin. I just adore it! I am very proud to be a member and want to wear my pin, but I fear losing it, so I have it in a safe place. For us, breeding our Shiba Inus is a labor of love. One that does not end when a puppy is sold, but continues on long past when the puppy is placed with a family. Each puppy is a life-long commitment to us. We back this up with the work we do with the puppies while they are with us so they are the best pets possible, the health testing we have done, our guarantees, and our availability to our Shiba’s family members for the life of their Shiba. Our only goal is to produce healthy, happy, long-lived dogs that we can share with others. The Shiba Inu is an amazing breed; unique to all others. We want to share the genuine qualities of this breed and honor the hard work the Japanese did to recover the Shiba Inu from near extinction. If you are interested in owning your own Shiba Inu and you have questions about the breed, please feel free to contact us. We’ll do our best to share our knowledge with you.